Patients are commonly immune compromised and therefore sensitive to air and water contaminants in the built environment. The concerns for infection control, particularly in operating suites, place unique demands on the performance and management of healthcare buildings and facilities. Our clients in the healthcare sector manage the associated risks through regular appraisal of indoor conditions and mechanical plant. And the information assists all stakeholders: infection control, engineering, management and regulators. At QED Environmental Services we work with public and private hospitals, day surgeries and aged care to ensure compliance and performance of indoor environments. 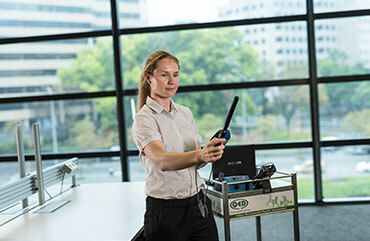 We are the only NATA accredited company in Australia for Indoor Air Quality inspections and have substantial experience in major public teaching hospitals as well as smaller facilities. Certain characteristics of healthcare facilities mean that regular monitoring of the built environment is critical. For example regular testing of warm water systems may prevent a legionellosis outbreak among immune compromised patients. In some spaces within hospitals air quality is life-threatening and regular testing is recommended, for example in operating rooms or infectious disease wards where air pressure differentials must be maintained. QED Environmental Services designs programs for managing risks and promoting performance improvement. We have developed a unique matrix of air quality results per clinical function which establishes a maintenance priority to guide reporting protocols, management action plans and capital budgeting. Construction and renovation present particular challenges when healthcare facilities continue to operate nearby, potentially exposing patients to cross contamination. In this situation QED establishes control measures which may include additional filtration and ventilation plus active environment monitoring. A typical hospital campus comprises structures of varying age whilst large aged care portfolios comprise facilities in diverse metropolitan and regional locations. QED schedules regular audit inspections and because we specialise in building compliance programmes, clients benefit from our tailored online service to keep their registers up to date across their whole campus or portfolio. When it comes to removal of asbestos, clients turn to QED for independent monitoring and advice. For 25 years QED has worked for WA's area health services: North Metropolitan, South Metropolitan and Country, whilst private clients include Ramsay Healthcare and St John of God Healthcare. Our clients in the aged care sector include Baptistcare, Mercy Care and Brightwater Care.